Many relics and artifacts were saved while other priceless works were lost in the catastrophic fire. Hundreds of millions of dollars in donations have been pledged for the cathedral's repair. Reporter: Notre dame now sits as an open wound. Tonight new images take us inside the 12-hour battle to save the cathedral. Rushing into the danger. Firefighters shooting powerful jets of water into the 850 year old cathedral. A legion descending on the scene, a major command post outside. As this piece of French history burned, the fire department sending up drones for a bird's-eye view. What they saw, the entire roof engulfed. This is what it looked like before. It's nicknamed the forest, built in the 13th century out of 13,000 trees, now just tinder. Gasps as the famous spire fell. Firefighters using water from the river. Their hoses trained on the church as day became night. Scaling the scaffolding, the famous gargoyles overhead. Then a robot sent into the cathedral as embers rained on the altar. Firefighters staring at the smoldering wreckage. This morning by daylight, a wider view of the destruction inside. Can you see firemen are still working to assess the damage. Working out if the building is still safe. But all around us, black ash, a memory of what happened last night. Part of the roof has disappeared. And some water leakages downstairs. And just a nightmare. Reporter: The timeline of the disaster coming into focus. A fire alarm sounding at 6:20 P.M. Inspectors search the building but find nothing. 23 minutes later another alarm. That time they see the flames, but it's too late. That 23-minute gap now part of an investigation authorities say will be long and complex. The cathedral home to a vast collection of Christian from the immaculate rose windows and the iconic pipe organ to the famed crown of thorns seen in national geographic's "The story of god" with Morgan Freeman. More than 13 million people come here every year, but only a fraction know that these vaulted ceilings house one of the most precious and closely-guarded relics in all christendom. Reporter: The crown Christians believe Jesus Christ himself wore on the cross. I know you said that if there is a crown of thorns, this is it. Yes. But what if there's not? Well, if it really touched Christ, of course, it is but even if it's not the true one, it's worth remembering, okay, he really was on Earth. He was a Truman. It could bear that. It could have that on his very head. And this is no story. This is no tale or symbol or obstruction, this is history, this is concrete. Reporter: That piece of history along with many others rescued from the flames and taken to the louvre for safekeeping. How much of the artifacts have been saved? Something like 80%. Reporter: 80% of the artifacts have been saved. Yes. Reporter: That's astounding. They are investigating whether the flames are linked to construction work ongoing. Today macron vowed to rebuild in five years. Donations are flowing in much of it from wealthy citizens. It gives me hope that we're going to be able to rebuild in full shape. I think that the reconstruction will be a sign of these believers in Jesus Christ. Reporter: Some believe it could take much longer. A precise digital replica of the cathedral captured in 2015 has bolstered hopes for the reconstruction. There's nothing written about it. There's nothing written that they said I built my cathedral because. So I've been using more sophisticated technology these days to get more answers from the buildings. Reporter: The architectural historian mapped it using kugts edge technology. His work will likely prove crucial to any rebuilding efforts. His major mission was to make sure as many people as possible understood the beauty of these gothic structures. Reporter: Lindsey cook of Vassar college inherited the project after his death. It took place over many years. This is something much more crucial especially after the fire at notre dame. It's happened to so many gothic it's not at all surprising. Reporter: Windsor castle was devastated by flames in 1992. But a $50 million repair project saw the official residence reopened five years later. Fire gutted this cathedral in 2009. But it was restored for more than $30 million in 2014. And just last year, a fire consumed the national museum of Brazil, decimating 90% of its collection. For the people of France, the return of their beloved cathedral cannot come soon enough. It was like getting a call from the hospital and you weren't sure they were going to make it and you had to get down there and say bye. Reporter: She was one of the hundreds who flocked to the site watching as the flames spread across the roof. It was like watching a really surreal, horrible movie, and everyone went ah! Reporter: You saw the glass explode. Saw the glass explode. It was, there were so many people, but it was so quiet. So, so quiet. Reporter: And people here were moved. They were crying? Yeah, there were people sobbing. There was a woman behind me sobbing into her phone. It was just shock. Reporter: People have been coming down here all day, and yes, there are a lot of foreigners, but mostly, it's parisians looking down to see what happened to their favorite building. For "Nightline," James Longman in Paris. Our thanks to James and our team in Paris. 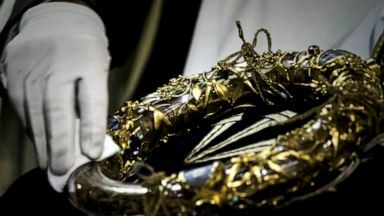 The relics included the Crown of Thorns, which is believed to have been worn on the head of Jesus Christ as he carried the cross to his crucifixion. 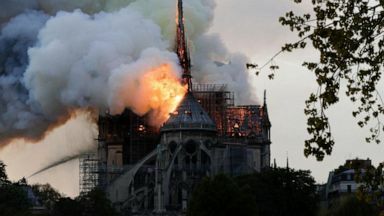 As the fire spread, authorities scrambled to rescue priceless art and Catholic relics from the 800-year-old Paris landmark; the mayor said the effort had been partially successful. 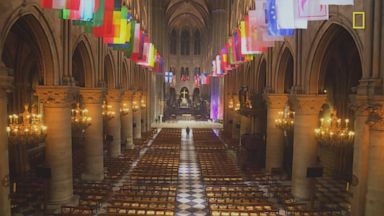 Drone footage shows Notre Dame Cathedral prior to devastating fire.